One of my “nerdy” posts, written principally to explain to myself what I’ve done, why I’ve done it and how I achieved it. 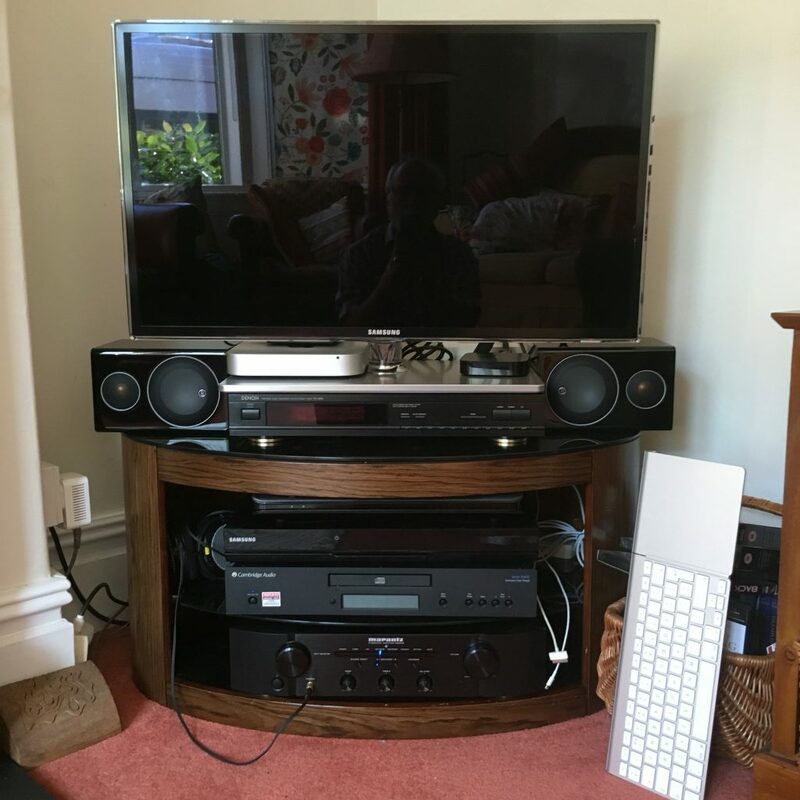 For a long time we’ve had the TV (Samsung UE32D6530) with a Blu-Ray 2.1 Home Entertainment Centre (Samsung HT-D5200) in one room and our HiFi system in another room feeding two sets of speakers in rooms other than the one the TV is in. OK so far? The BluRay sound output was OK but not that subtle and certainly I had problems with a) getting headphone output for late night listening to music concerts, and b) lip sync between the BluRay player and the TV, which could be very annoying and difficult to resolve in a time short enough to actually enjoy the music!! Coupled to that there was always the need to have the BluRay controller and the TV controller to watch TV. The first to control the audio, the second the HDMI sources. Every project requires a driver. What happened was that we were thinking about knocking a couple of rooms together the effect of which would be to disturb where the HiFi was. “Why don’t you move it into the room with the TV?” – it was suggested. So … anticipating needing to buy an AV Receiver and lots of other stuff like a Soundbar, I went off to Richer Sounds (Cardiff) where Andie amazed me by advising I didn’t need to spend anything. My existing Marantz amp (PM 6005) had an Optical connection, so it could take the sound input from the TV which also had an Optical outpuut, as it had 4 HDMI ports, could act as the hub instead of needing to buy an AV Receiver. Amazing and what service too! So I set it up. The four HDMI ports on the TV taking a MacMini, the BluRay player (now with its speakers disconnected), the Cable TV and a 3rd generation Apple TV. The amp taking input from a CD player (Cambridge Azur 540C) and a Tuner (Denon TU-260) – we’ll leave connecting the deck for another day. The TV and the amp connected by an optical cable. I tested it using an existing pair of speakers. Brilliant sound and everything worked. All problems resolved and much easier to use as the Marantz remote control handles all the sound, the TV remote controls all the video sources with of course the Cable TV controller being used for channel selection, etc. I was getting excited. Perhaps I could benefit even more from a new pair of compact speakers, thus allowing me to leave the existing Bose Acoustimass 5 and Gale speakers in place. I was easily persuaded back at Richer Sounds to try out at home a demo pair of Monitor Audio Radius 90 speakers. After only a few plays of DVD, CD, iTunes, TV and BluRay media I was quickly persuaded this was the right choice and that’s the setup you see in the picture, with one additional hidden addition. How might I integrate my digital music in a better way than I was currently doing it via the Apple TV, and iTunes on the MacMini? The answer … a Sonos Connect system with RCA output to the Marantz amp connected to the iTunes Media folder and a copy of the iTunes Library hosted on a USB-3 disk connected to an AirPort Extreme router. [The master iTunes Library is shared (using Dropbox) around the other 3 Macs in the house – a brilliant solution to avoid maintaining different iTunes Libraries.] I can now listen to the digital music in all three rooms. Of course, now I have a Sonos Connect, I can stream to other Sonos Play speakers … but that’s for another day, which may actually come sooner rather than later. So there you have it, a Media Centre with Tuner and CD player; a MacMini, Cable TV, BluRay and an Apple TV all connected to the Smart TV, with the Apple Extreme Router and the Sonos Connect. There’s also a Time Machine backup disk connected to the MacMini which backs up the iTunes Media on the external USB disk.